Beaker is an automated software testing application that allows users to store, manage, run and review the results of customized tasks. A task is a script that performs a specific task (or multiple tasks) and presents these task results to the user. These tasks consist of code, data, meta data, shell scripts, hooks to other code, and additional packages (or dependencies). Beaker provides an interactive web application and shell based client to do this. Although tasks can be written in any language that is supported by the target host, environments such as rhts-devel and beakerlib are often used. Tasks are written and (ideally) tested before being packaged and uploaded to the server. Once they are uploaded to the server, they are then available to deploy to a target host. The stdout of a task executing on a target host is captured and made available via the beaker web application. 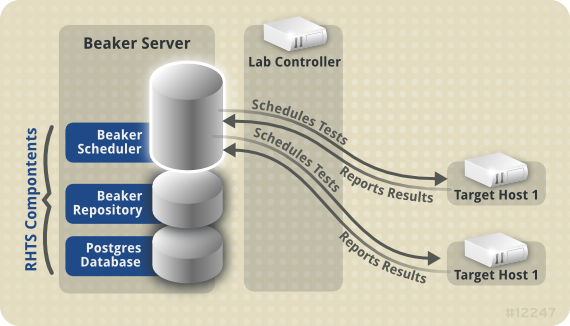 The Beaker scheduler co-ordinates the target host systems that will ultimately run the tasks. It manages system selection and the co-ordination of multiple hosts if the job specifications require them. It also manages the schedule of when recipes are run. Currently it operates on a simple FIFO queue. The scheduler does allow some recipes to be prioritized over one another in a non FIFO fashion. This can happen if the recipe matches only one system (priority is bumped by one level), or if the priority is manually set (in which case it can also be set lower). The server hosts the scheduler, the task repository and the web application. Optionally, the lab controllers and database can also live on the server. The target host makes requests to the server for packages that it needs to create and setup the local test environment, then runs the tasks specified in its recipe. These are run locally on the target host. The target host runs only one recipe at a time, and before each recipe is run it is re-provisioned with a fresh distro install. As such, the target host reports the results back to the server; It does not store them locally. The Beaker database is responsible for storing inventory, users and groups, jobs, historical activity, task results and more. It is configured in /etc/beaker/server.cfg (or an alternative configuration file if one has been specified) with the sqlalchemy.dburi key. Any database type that is supported by sqlalchemy can be used, however the test suite is only run performed against MySQL.